A sophisticated new gas detector that can spot even minute traces of more than 70 hydrocarbon gases has been introduced by Sensor Electronics of Minneapolis. Carrying full CSA performance-tested approval, this new detector is particularly well-suited for off-shore platforms, pumping stations, pipelines, refineries, fuel dumps, petrochemical plants, waste-water treatment facilities – or wherever a gas leak could mean explosion or death. Calibration is a breeze. The new detector simply sniffs a sample of the suspect gas – methane, say – then automatically locks itself onto methane’s particular infrared "signature." Then any methane concentration over a preset threshold triggers an immediate alarm. 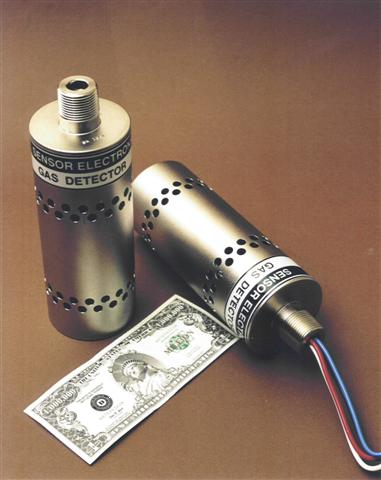 Simply showing the detector a different gas – as propane – will register its IR "signature." Such a changeover for any hydrocarbon gas can be done in seconds. In operation, the detector continually monitors the ambient atmosphere. Any trace of a suspect gas is immediately sensed by twin tuned IR sensors. Built-in circuitry automatically compensates for aging components and changing environments. This new sensor uses simple optics (no mirrors or beam splitters) so it shrugs off rain and snow, fog and smog making it ideal for use under adverse weather conditions. Nor is it affected by temperature extremes, high hydrocarbon vapor levels or low oxygen atmospheres. Besides conventional hydrocarbon vapors – gasoline, methane, butane, ethanol, kerosene, jet fuel – the sensor can spot such diesel, propane etc. Output is 4-20 mA, to drive computers, plotters, printers, recorders and the like.